Want it by Wednesday 24th April? Order within 10 hours, 52 minutes and choose Royal Mail 24 Hour Delivery at checkout. 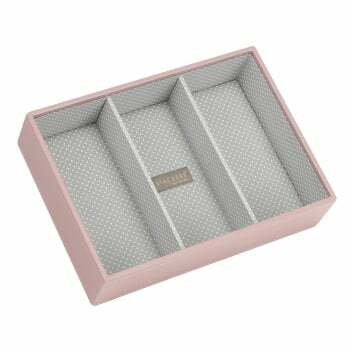 This soft pink stacker with grey polka dot lining is part of the classic collection and features 3 sections which are deep enough to store watches, bracelets and glasses perfectly. Place it under your soft pink lidded stacker for a pretty and practical jewellery storing solution.